ICYMI: Parts of a mastodon and maybe a mammoth were found while digging the Purple Line Extension at Wilshire and La Brea. Here’s the post with some cool pics. In this op-ed, the Los Angeles County Sheriff Jim McDonnell argues that the best way to keep Metro patrons safe is keeping the Sheriff’s Department as the sole policing agency for Metro. Why? The Metro Board of Directors on Thursday will consider a Metro staff proposal to split that contract between the LASD, the LAPD and the Long Beach Police Department. McDonnell says that plan puts riders at risk. By all measures of effectiveness, the LASD has done a tremendous job fulfilling its contract with Metro, given personnel and fiscal restraints that are imposed by Metro. While crime is rising in communities across the county, crime on the Metro transit system countywide has declined 8 percent. It has declined 58 percent at Union Station alone. The LASD has an 86 percent crime solving rate. We have created the model for transit specialized services with a nationally recognized counter-terrorism Threat Interdiction Unit, a Transit Mental Health Evaluation Team, undercover deputies, and explosives detection and canine units. We have gone above and beyond the contract requirements that Metro stipulated. It’s probably worth mentioning one point that came up during Metro Board committee meetings on the new proposed contract: when McDonnell was previously the chief of the Long Beach P.D., he advocated for a multi-policing agency approach for Metro. In committee, McDonnell explained that he wants LASD to be in charge of policing the system with help from muni police forces who are compensated by Metro. (You can listen here at the 53 minute mark). •Establishes consistent, reliable staffing of approximately 240 law enforcement officers per 24 hour period, which is an improvement over the current staffing which ranges from approximately 160 to 200 personnel assigned to the system each day. •Increases emphasis on patrolling the bus system and corridors. Grows the bus riding team from 6 to 34 law enforcement officers, a 466 percent increase in staffing level and coverage. Metro’s security chief also told Board Members that under the current LASD contract, he often does not know what police staffing will be like on a day-to-day basis. It should be an interesting and long meeting tomorrow, folks. Live audio and video streams will be available here after the meeting begins, which is scheduled for 9 a.m. It’s going to be a coffee and Mountain Dew day, me thinks. If the board approves the motion Thursday, the agency will move to create a new system to deal with youth fare evasion that minimizes interaction with law enforcement, takes cases out of the probation system and potentially eliminates all financial penalties for fare evasion. An alternative penalty has not been officially proposed yet, but it could include community service or completion of an online educational program. Metro already offers discounted youth tickets for $1 instead of the usual base fare of $1.75. Very interesting piece of public policy. Most of us, I’m guessing, probably want something in place to discourage people from stealing free rides but don’t want to see punishments that are out of proportion with the crime. Thoughts? L.A. Mayor Eric Garcetti said he spoke on the phone recently with President-elect Donald Trump and that Trump supports the L.A. bid for the 2024 Summer Games. The other two finalists are Budapest and Paris, with the International Olympic Committee set to pick the winner in September. An earlier USA Today article had quoted anonymous U.S. Olympic officials saying that a Trump presidency could engender ill will from other nations and put the L.A. bid at risk. Of course, IOC officials have twice awarded Olympics to China and put the Games in other places with their own political or logistical issues. Then again, I suppose a lot of water can pass under the bridge between now and September. In terms of L.A., the passage of Measure M was seen as showing the IOC that we’re serious about upgrading our local transportation infrastructure. See this post for more about that. Transit seems to play a bigger role in more shows, so says NPR. 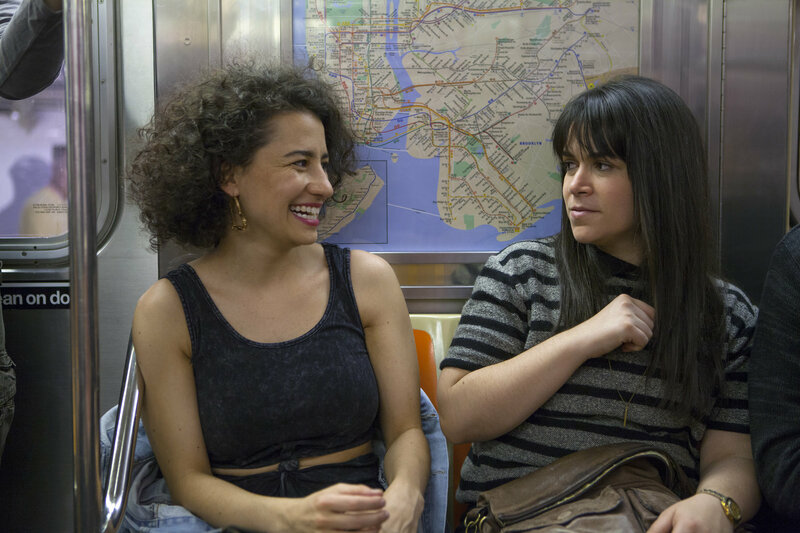 As for “Broad City,” I’m guessing whatever they’re discussing above can’t delicately be described here. Things to read whilst transiting: “How stable are democracies? Warning signs are flashing red” in the NYT. A new study suggests that just because a country becomes a liberal democracy doesn’t necessarily mean that a country stays that way. And there’s research showing that the number of people who say it’s essential to live in a democracy has declined. Interesting stuff especially for those who believe — as I do — that the only constant in the world is constant change. It’s probably why I like “Planet of the Apes” and “The Walking Dead” so much. I see the shows as reminders to cherish what we have because change can be sudden, it can be violent and it may be very surprising who ends up running the show, whether it’s Cesar, Negan or someone else. Proposed new rules from the Federal Railroad Administration would allow American rail cars to be built to European standards, meaning the cars don’t have to be built like tanks. That could hypothetically lead to faster train service. Problem is, in some areas — i.e. California — Amtrak and Metrolink have to run slow because there’s only a single track. Which explains the un-21st Century-like 11-hour journey from L.A. to Oakland. Fare evasion is akin to stealing. A $75 fine is about the cost of a parking ticket in LA. That is reasonable and I rarely if ever see people get more than a warning anyway. If anything we should be stepping up enforcement and penalties. This will only increase fare evasion. I will be really disappointed if this passes and becomes policy as it is a slap in the face for law abiding taxpayers. Why have any police at all?! 6 bus riding officers for 1 million riders, those cops might as well not exist. All Metro needs are cops at every turnstile making sure people TAP. That is it, keep the people who don’t pay out of the system. Whatever the board does us Metro riders will still be fending for ourselves on the buses and trains. I ride everyday and I’m not scared of a terror attack, I’m scared of getting attacked by someone with drug or mental health issues. I have a lot of respect for the women who ride because they have to deal with things that no human in a civilized society should have to deal with, no new police contract is going to fix that. I would love to see the youth fare evasion be decriminalized and I fully support this motion. Policies like aggressive fare evasion penalties create antagonistic relationships between riders and agency staff. I disagree with arguments that all riders need to pay their fair share. We have the widest income gap of any industrialized nation. Charging a standard fare that applies to all incomes is fundamentally unfair in our socioeconomic context. Given that fares account for less that 1/4 of Metro’s operating budget, I do not contend that the small amount of people who do not pay for tickets are going to crumble the system. I would project that the amount of money spent on checking fares (including the millions upon millions given to Cubic for turnstiles) far exceeds revenues lost to fare evasion. I would like to see a shift away from blaming riders who don’t pay. In Trump’s America, we have are far too normalizing a culture of scapegoating. Some questions I have are: why are people not paying fares? How can we shift the focus from those who don’t pay fare to putting pressure on public officials to increase state + federal transit funding? What is the role of fare in public transit operations? Could we imagine a fare free Metro? You don’t have to run slowly just because you have a single track. You just have to timetable intelligently, and put in additional infrastructure where necessary so that trains can pass each other. In the UK, the classic example is Salisbury – Exeter. 88 miles in 110 minutes isn’t high speed rail, but that includes 12 intermediate stops. Trains run every hour each way. In July a few years ago (2012?, 2013?, 2014?) BART had a fare-free day because of excessive smog. The SF Chronicle reported that teenagers used the opportunity to harass passengers, but didnt specify the nature of the harassment. Emeryville, a small suburb of SF (similar to Vernon), has a fare-free transit system, paid for by major companies in Emeryville. Google Emery-Go-Round.